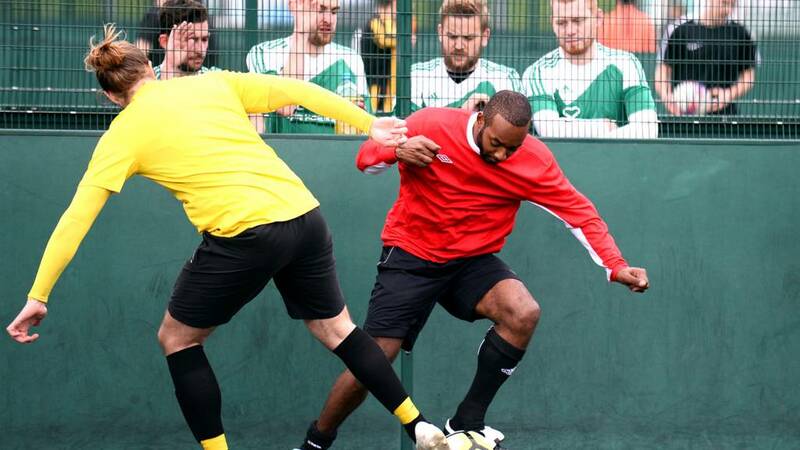 Keep the conversation going on #PeoplesCup and catch up with Saturday's action here. Watch first-round highlights on the iPlayer from 06:00 GMT on Saturday, 4 March. Play video How on earth did he score from there?How on earth did he score from there? Play video How on earth did he score from there? Play video Crossbar challenge in Sutton. from BBCCrossbar challenge in Sutton. Play video Was this a penalty?Was this a penalty? Play video Was this a penalty? Play video Jan Milner reads her poem about walking football. from BBC SportJan Milner reads her poem about walking football. Sadly we've come to the end of our FA People's Cup round one weekend coverage. There are still a handful of matches going on out there so good luck to those of you still playing. We've had record-breaking numbers, great laughs, smiles and plenty of brilliant football. Don't forget to watch next weekend's highlights show. It could be like watching yourself on Match of the Day! A big shout out from us to all of the organisers, referees and team taxi drivers. Until the regional semi-finals on 24, 25, 26 March, that is all from us. Goodbye! We're out of breath here never mind the players! Deportivo Lackovtalent have just been interviewed pitchside by our presenter Nick Bright following their thrilling win in Birmingham. You'll be able to see that interview on Saturday 4 March at 13:00 GMT in the highlights show on the BBC Red Button. Wonderful goal in a previous round from Deportivo. Their celebrations are even better as they do 'the Ronaldo'! Full time 3-2. Thoroughly enjoyable game and fitting end to a great competition here in Birmingham Star City. Deportivo take the lead again. Lovely finish. The forward beats his man and cooly finds the bottom corner. A£89 million have it all to do again. There are just minutes left. It looked to over for A£89 million but they've keep at it. Two quick goals and we're all level. Deportivo score twice in 30 seconds. It could have been three in a minute if not for the heroics of the A£89 million 'keeper. Early stages and Deportivo have all of the ball. No goals yet but lack of talent certainly look the most threatening. We've got something a little special coming up for you. Tom, our reporter Birmingham, is pitch side of the Adult Male final between Deportivo Lackovtalent and A£89 million . Screamers, showboats and sweet shots - here's some of the best goal action from today. Team Energy are your Norwich winners! Here's full details of what went on in the latter stages. These boys look pleased with their days work and no wonder, their hopes of lifting the FA People's Cup trophy at Wembley are still alive. The regional semi-finals will be no laughing matter though boys. Congrats to Craigy Had A Dream who are the winners in Liverpool. They're be marching into the next regional finals next month. The FA People's Cup round one weekend is nearly over but fear not, you can relive it all in next week's highlights show. It'll be packed full of goals, saves and great stories from across the weekend in all of our 16 categories. You can catch it on Saturday 4 March at 13:00 GMT on the BBC Red Button or catch up afterwards on BBC iPlayer. Don't miss it! You might spot yourself. We're glad you enjoyed it. It's the teams such as yourselves and all of the volunteers who make this competition what it is. App users may have to click view more to see this tweet.